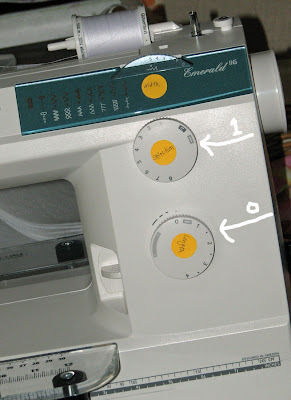 For those of you like me who have been sewing for years, and didn't know that you could use your sewing machine to attach a button. Well this is for you, as well as the beginner sewers out there. I told you all that I recently bought a new Viking sewing machine. This machine came with free classes, and my first was about a month ago just on the basics of my new machine. Sewing a buttonhole as well as attaching a button was basic. Something I had never ever done. So here is a tutorial after much practice so that all of you can pick up this very cool way to make beautiful strong buttons. First Drop the teeth on your machine also called the feed dogs. On my machine this is a switch on the back ( see photo above) after turning the wheel you can see the teeth drop away from the top of the plates. These teeth are used to guide the fabric. 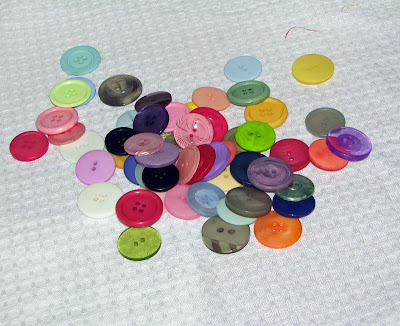 Since we are sewing a button we do not need to guide it. Next remove your presser foot so that you have a bare needle. (some machines have a special foot just for this but most of you do not really need it. The foot can usually be removed by pulling forward or backward as it just snaps in and out. Some machines have a screw on foot. The bottom wheel on my machine is the length of my stitch. To sew a button I want this wheel all the way to Zero to get a nice tight stitch. No length is needed. 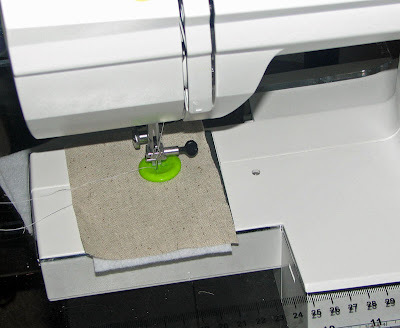 Position your button onto your fabric and drop the needle down. Use the hand wheel to turn it and make sure that you are striking that button exactly. When you know it's right, put a few stitches into the button 3 or 4 should be just enough. now making sure that your needle is in the upright position. Change only the selection wheel to the number 2 selection. 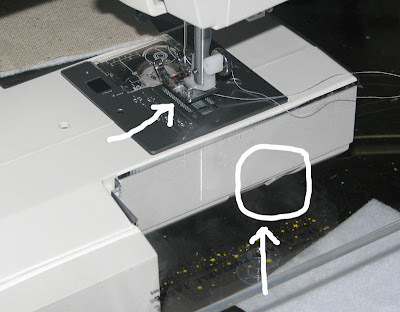 On most machines this is a zigzag stitch. 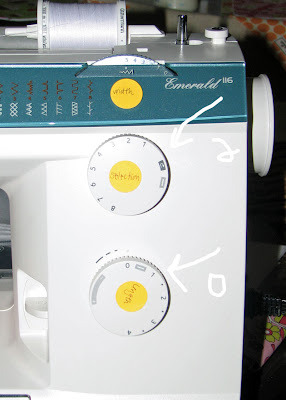 Again using the hand wheel, find the second hole of your button by adjusting the width wheel (shown on top of my machine) Mine is all the way at 5 usually for buttons. Turn the hand wheel a few times making sure the button goes back and forth into both of the holes. Then when you are comfortable with your settings go ahead and use your foot pedal. 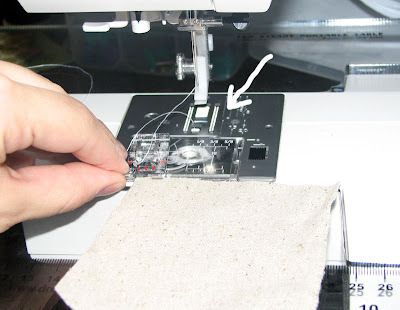 After you are happy with the amount of stitches in your button, with needle in the upright position, turn the selection wheel back to 1 (straight stitch) and sew 3 or 4 more stitches into the first hole only. This will tighten the stitch for you and you will not have to worry about it coming unraveled. That's it you have a beautiful button, and strong to. I just love they way they look. Try some yourself. it took me awhile to get all the changing of the wheels and such but after you learn it, really it goes faster then by hand. Thanks Terri! 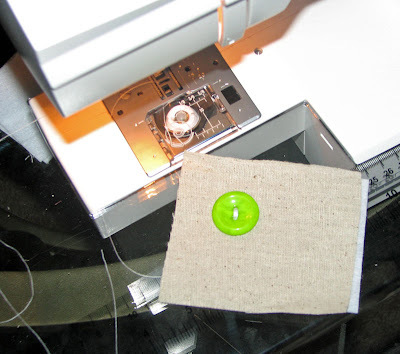 I've always known that you can use a sewing machine to sew on buttons, but I'd never attempted it. And I really hate sewing on buttons! I'll be trying this next time for sure. and this should work on any machine? How neat, thanks! I use the "button" foot on my Brother. I read the directions in the book and it was so easy. If it weren't for changing the foot, I would use it everytime I sew on a button. If I am doing more than one (or am already at the machine) I use it anyway. Super easy. I have a Viking too...love sewing on buttons this way. Thanks for the tutorial. Hugs from Brazil Here it's very cold now. thanks! i will definitely try this next time!